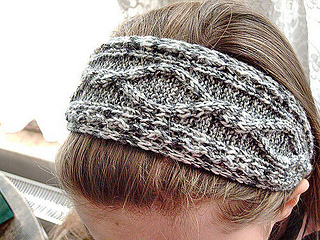 Bamboozled is a cabled headband with twisted cord ties. It’s a very quick knit, and uses less than 100 yds of yarn, making it a great way to use up those oddball skeins in your stash. 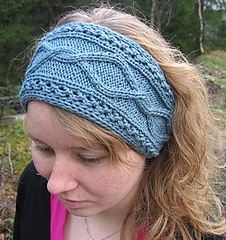 The suggested yarn is 100% bamboo, but you can use any worsted weight yarn. The pattern is fairly easy, suitable for an advanced beginner and would be fine for a first cable project. Cabling can be done without a cable needle if desired.